About 496 quarry laborer from NH 10 area joined TMC in a program held at Teesta Hat Bazar . The laborer who were badly been affected after NHPC Dam started working at 29th Mile was asking for justice for many years but the ruling party did not placed our demand properly one of the lobar said today. 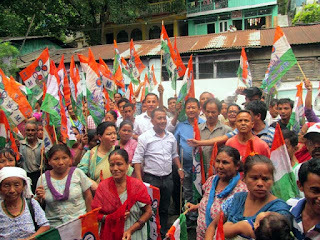 TMC District President Rajen Mukhiya in presence of District portfolio holder the laborer today accepted the TMC flag . The party has promised to fulfill all the demand of the labour.